Benjamin B. Levy, a young Jewish volunteer, received the Medal of Honor on 1 Mar. 1865, one of the first Jews so recognized. He entered service in the 1st New York Infantry in New York City on 22 Apr. 1861. During the Battle of Glendale (Frayser's Farm) on 30 June 1862, under heavy fire near here, Levy "took the gun of a sick comrade, went into the fight, and when the color bearers were shot down, carried the colors and saved them from capture." He later reenlisted in the 40th New York Infantry and was wounded at the Battle of the Wilderness in May 18641. Benjamin  one of the smallest of the landed tribes of Israel linked to the largest and most powerful tribe of Judah. Levi (Levy)  a landless Jewish tribe dependent upon the ritual structure of Israel for survival. The Levites were not identified with militarism. The heavy coastal artillery cannons from General Bragg's Charleston, South Carolina Confederate batteries screamed, crashing and exploding with death into the Union harbor fortress of Ft. Sumter. The fine ladies of the city stood on the embankment and watched the defiant birth of Southern Independence, almost giddy under their parasols. It was April 12, 1861. Pessover had been early that year, March 15. Shevuot, the anniversary when Jews celebrate the giving of the Torah and the Ten Commandments, of which "Thou Shalt Not Kill" is one, was still three weeks away. President Abraham Lincoln issued a call for volunteers to put down the rebellion, to "Save the Union". Benjamin Levy answered Lincoln's call. He enlisted as a drummer boy with the 1st New York. He was barely 16 years old at the time. Drummer boys were essential communication and coordination personnel in the armies. The drums called assembly. The drums reflected orders and instructions. The war was expected to last a few short months. It dragged on into four horrifically bloody and traumatic years. Far more Jews enlisted in the armies, both North and South, than were represented by their proportional percentage in the population. The Generals of the American Civil War learned their craft during the Mexican American war fifteen years earlier. The order of battle remained essentially unchanged. Military technology had changed significantly. The tactics had not. Battle lines were drawn up facing each other across open spaces, sometimes only a short few dozen yards apart. The men raised their guns facing the opposite enemy lines. Upon command they fired in blazing volleys of blinding gray-blue smoke and lead into the massed ranks of the enemy to their front. Men screamed and fell as death drove bullets into their chests. Confusion and terror gripped the lines quickly. Smokeless powder had not been invented and with each volley the visibility declined to almost nothing. They reloaded and fired massed barrels into where the supposed ranks of the enemy stood. The sounds of the drums, barely heard. It was the sight of the battle flags of each regiment that identified friend from foe. Lines staggered and moved. Only if you could see the flag could soldiers tell where you they were  the smoke, confusion and terror, overwhelming. The battle flag stood tall, straight or waving in rallying furls. If in the blinding bloodletting the soldiers lost the continuity of their battle line, death easily walked up. Men were killed by the enemy or even by their own men firing into the impenetrable smoke. The most dangerous assignment on the battlefield was the flag bearer, the “Color” bearer. The first soldiers to be cut down in battle were the Color bearers. When you kill the color bearer, the enemy regiment could be killed. The battle lines depended on knowing where the front was, where your side was, where the enemy was. Seeing the colors was essential. In the first few moments of the battle the Color bearers of the 1st New York were cut down. The withering fire from the Confederate line, heavy and deadly accurate. The 1st New York staggered as the whizzing lead slammed into men with dull thuds. The Union line wavered in the smoke and lost its cohesiveness. The Colors had to be saved. As men about him fell bleeding, cut to pieces, wounded into frightening crimson screams of pain, Private Levy jumped forward and grabbed the fallen colors, raising them anew. Waving them bravely, he heartened the men of the 1st New York. The line stabilized and rallied about the battle flag. The regiment was saved from probable total destruction by the skinny Jewish drummer boy. For his extraordinary heroism under fire, Levy was cited for gallantry. In 1865 he was raised to the highest pantheon of American military heroism. He was one of at least six Jews so honored during the Civil War. America recognized the men, awarding them America's highest recognition of bravery, the Congressional Medal of Honor. In all probability, Levy was the first American Jew to earn the honor, the distinction and recognition of the Medal of Honor. Six Jews are recognized by the Jewish War Veterans of America as earning the Congressional Medal of Honor during the Civil War. CITATION: At the battle of the Wilderness, on 6 May, 1864, he rallied and reformed the disorganized fleeing Union troops from several regiments and established a new line of defense that held. At the Battle of Petersburg, Virginia, 30 July, 1864, he bravely and coolly carried orders to the advanced Union line while under severe fire from Confederate troops. CITATION: In hand-to-hand combat while on a reconnaissance along the Berryville and Winchester Pike, he captured the colors of the Confederate Army's 8th South Carolina Infantry. CITATION: In the Battle of Chancellorsville, he was one of a party of four under heavy fire. They voluntarily crossed the enemy lines to capture and bring back to the Union lines a wounded Confederate officer from whom valuable information was obtained concerning the position of the enemy. CITATION: In the Battle of Charles City Crossroads, Levy, a drummer boy, rescued the two standards which were dropped by their wounded color bearers. He unfurled them and carried them throughout the battle, preventing the colors from being captured by theConfederate soldiers. At Shiloh, Tennessee, Vicksburg, Mississippi, etc. Citation: In the Battle of Wilderness, the Confederate forces had charged the Union lines many times and the woods were full of smoke. 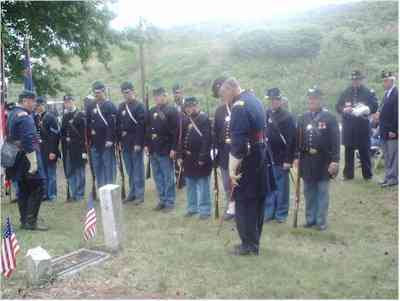 Sergeant Leopold Karpeles was entrusted with the colors which he kept waving as it was the only visible thing the Union soldiers could see. General Wadsworth rode up and down the Union lines on his horse shouting to his disarrayed soldiers "rally around the flag boys!" Risking his life, Sergeant Karpeles kept waving the flag as Confederate gun fire kept missing him. The Confederate Army was checked and defeated as the Union soldiers were able to reform their lines and fight back. For his bravery in face of the enemy fire, Sergeant Karpeles was awarded the Congressional Medal of Honor. Proportional to their percentage of the general American population, the American Jewish soldier earned the Congressional Medal of Honor at three times the rate of the non-Jewish soldier during the Civil War. The actual number of Jewish Medal of Honor recipients and commendations for bravery may have been even greater. It can not be fully verified. The simple reason was fear and anti-Semitism. If a Jew was wounded in battle, the nature of American anti-Semitism was such that the Jew could be left behind on the field while the Christian wounded were evacuated first. It was a simple matter of practical survival to keep Jewish identity quiet or even secret. Levy proudly and openly affirmed his Jewish identity. Mark Twain was one of, if not the greatest American literary humorist, journalist and observer of American popular culture in the 19th century. He reflected on the majority American view of the American Jew. Twain did not suddenly reinvest the old anti-Semitic canard that Jews do not fight for their flag or are unpatriotic. Twain was not the first to write and say what he said about American Jews. He simply reflected the popular culture anti-Semitic myth that permeated American imagery of the Jew. In the late 19th century, American writers increasingly claimed Jews do not fight and if they served it was in back areas where it was safe from danger. The Grand Army of the Republic, a Union Army Veteran organization organized in 1866, rose to its largest membership in 1896. They did virtually nothing to dispel the anti-Semitic myth about the American Jewish fighting man during the Civil War. March 15, 1896, seventy-eight Jewish veterans of the Union armies gathered and met in New York City's Lexington Opera House. They organized the Hebrew Union Veterans organization. The purpose was to recognize the accomplishments and participation of the estimated 6,000 Jewish American soldiers who served in Union armies. The Hebrew Union Veterans organization was the antecedent of the later Jewish War Veterans of the U.S.A. The Benjamin Levy marker is not unusual in and of itself. It is about the bravery and sacrifice of a Union soldier on the front lines of the Civil War. What is unusual and very significant about the Levy marker is the simple wording of the text. "Benjamin B. Levy, a young Jewish volunteer, received the Medal of Honor on 1 Mar. 1865, one of the first Jews so recognized." Most significant is the word Jewish in the text. Change the text. If the word Methodist, Catholic or Baptist were used instead of Jewish, the meaning of the marker is confused, different and hard to understand in contemporary American life. The context of the term Jewish, as opposed to Protestant or Catholic, is the understanding of Jewish American legitimacy. A Catholic or Protestant American is inherently understood as simply American. If interpreted through the prism of anti-Semitic cultural imagery, Jews are not part of the American story. Jews don't fight. Jews are not a religion but a people, separate and apart from the formative struggles of the American experience. Jewish American identity and legitimacy is repeatedly being reaffirmed with the word Jewish. Jews actively identify those who have contributed to the American experience as Jews and in the same instance deny that it has any significance. American Jews assert and in the same breath insist on the irrelevance of Jewish identity or even marginal Jewish background. Jewish legitimacy in America is established because Jewish Americans chose to be part of America. Separate Jewish American identity is denied and not emphasized because it negates American universalism and the myth of the absence of American anti-Semitism. American Jews, consciously and subconsciously, identify themselves as a religion and not a separate people. Understood, but not voiced, is the implication of anti-Zionism and the accusations of dual allegiance. Jews need to visibly establish symbols and recognition of their equal legitimacy as Americans. In written form, Simon Wolf documented, in his 1895 seminal work, "the American Jew as Patriot, Soldier and Citizen", American Jewish historical legitimacy. The Benjamin Levy marker is simple. It visibly affirms Jews as legitimate Americans. A year after Mark Twain wrote his famous article "Concerning the Jews" in 1898 he apologized. When I published the above article in Harper`s Monthly, I was ignorant -- like the rest of the Christian world -- of the fact that the Jew had a record as a soldier. I have since seen the official statistics, and I find that he furnished soldiers and high officers to the Revolution, the War of 1812, and the Mexican War. In the Civil War he was represented in the armies and navies of both the North and the South by 10 percent of his numerical strength -- the same percentage that was furnished by the Christian populations of the two sections. This large fact means more than it seems to mean; for it means that the Jew`s patriotism was not merely level with the Christian`s, but overpassed it. When the Christian volunteer arrived in camp he got a welcome and applause, but as a rule the Jew got a snub. His company was not desired, and he was made to feel it. That he nevertheless conquered his wounded pride and sacrificed both that and his blood for his flag raises the average and quality of his patriotism above the Christian`s. His record for capacity, for fidelity, and for gallant soldiership in the field is as good as any one`s. This is true of the Jewish private soldiers and the Jewish generals alike. Major-General O.O. Howard speaks of one of his Jewish staff-officers as being "of the bravest and best"; of another -- killed at Chancellorsville -- as being "a true friend and a brave officer"; he highly praises two of his Jewish brigadier-generals; finally, he uses these strong words: "Intrinsically there are no more patriotic men to be found in the country than those who claim to be of Hebrew descent, and who served with me in parallel commands or more directly under my instructions." 1 Virginia State Historical Marker erected and funded by JASHP at intersection of Long Bridge Road and near Glendale, Virginia. The Jewish War Veterans of America declined to participate in the marker project or subsequent proposed marker projects recognizing American Jewish recipients of the Congressional Medal of Honor.